Lady Godiva was an English noblewoman who rode a horse unclothed, covered with her long hair through the streets of Coventry to prevent locals from paying extra taxes. Pragmatic Play has beautifully designed this 5 reels and 20 paylines slot game with colourful reels and rewarding symbols. On the reels, you will find very familiar symbols like: White Horses, Peeping Tom, Lord Leofric, Lady Godiva, A, K, Q and J landing on your reels to form winning combinations. Enjoy the Autoplay option which gives you the opportunity to set a given number of autospins to play. These range from 10, 20, 30, 50, 70 and 100. Set your bets using the + or – signs in the Bet Field, which is located at the bottom right of the screen. Bet Levels: Select bet levels ranging from 1 to 10. Amount of Paylines Selection: All 20 paylines are fixed and cannot be amended. Coin Values: Stakes range from £0.01 to £0.50. 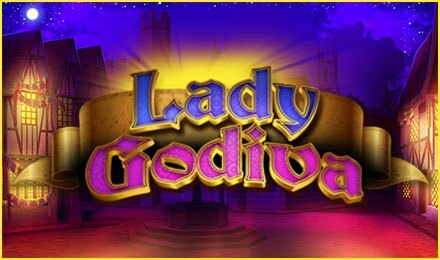 Symbols on Lady Godiva slots include the wilds which land fully stacked on the reels, fill the whole reel or if you’re lucky, fills multiple reels. The wild is Lady Godiva herself. This symbol replaces all other symbols bar the scatter. The wild symbol serves the purpose of increasing your winning chances by helping complete winning combinations. Land three, four or five of the Fleur De Lys scatter symbols anywhere on the reels and choose from a selection of free spins and multiplier values to put to play. Retrigger the Free Spins Feature by landing more scatter symbols during the play of the feature.